Yesterday I had the privilege to speak to over 2,500 people at the lobby against the trade union bill. It was a fantastic event, with union members travelling from all over the UK to talk with their MPs in person. Spirits were high, even though the queues to get into Parliament stretched on and on. Even the police told us it was the biggest lobby of MPs they’d ever seen. And now, just one day on, it seems like the pressure on the government is paying off. This afternoon they have announced a big climbdown on some of their proposals to restrict picketing and protest. The Government has now dropped its proposal to make unions publish a protest and picketing plan 14 days in advance. This would have made unions spell out in great detail how they planned to campaign during a strike. It would have given employers and the police two weeks’ notice of everything the union planned to do – where and when pickets would be held, how many would attend, even whether megaphones would be used. And it would have made unions declare online campaigning plans – including what they were intending to post on Facebook and Twitter. And if they didn’t stick to the plan, unions would have been liable for fines of up to £20,000. The government has also decided not to go ahead with proposals to create new criminal offences around picketing or to make every picketer wear an armband or give their name to the police – more wins for our campaigning. Crucially, the government have dropped their proposal for the picket organiser to have to carry a letter of authorisation with their name and address on, which would have to be shown to the police and any member of the public who asked to see it. But of course there’s still lots we aren’t happy about. Picket organisers will still have to wear an armband. They’ll still have to give their name and address to the police. And they’ll still have to carry a standard letter from the union authorising the picket. So concerns about blacklisting and victimisation may be reduced but they haven’t gone away. And, more widely, from giving employers powers to substitute strikers with agency workers and new opportunities to win injunctions and damages, the trade union bill is still a fundamental attack on the right to strike and to organise – in ways that I have set out time and again. The bill gets its final Commons vote next Tuesday, before it moves on to the Lords. Concern has been growing amongst government backbenchers. At second reading we saw five Conservative MPs speak on the bill, with David Davis MP threatening to oppose at third reading unless it was changed. Will this last minute compromise be enough to buy back the votes of worried Conservative MPs next week? And convince the sceptical Lords in the weeks that follow? We shall see. 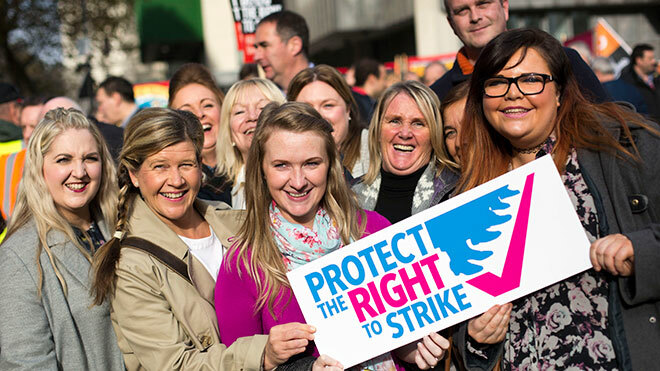 And the TUC will continue to fight this threat to the right to strike every step of the way. If you haven’t yet written to your MP about the trade union bill, there is still time to do so before the final reading on 10 November. Frances, please keep the pressure on this right wing government. We cannot wait and hope that the house of lords will back a campaign to rid us of this historic attack on free trade unionism. We have our own power to defeat it. The power of six million trade unionists to withdraw our labour. If we do not use that power now in a 24 hour national strike we will NEVER be able to use that power again as they will have made it illegal. In the name of the generations that came before us and who fought to ensure our dignity in the workplace.NAME THE DAY ! Thatcher’s anti-trade union laws were never repealed despite 13 years of a Labour government’s opportunity to do so, however this clearly never troubled the TUC then. The TUC and trade unions’ leaders’ complacency and Labour’s neglect to repeal these laws when it had the chance clearly emboldened this vicious Tory government and laid the foundations for them to further build on and escalate the attacks. The question then is how much comfort can workers’ take with such a vague statement as ‘And the TUC will continue to fight this threat to the right to strike every step of the way’? Neither of these were in the bill or the consultation in the first place. Why are you pretending that they were? For us to stand by and allow this anti TU bill to be implemented is not only showing that we have no respect or gratitude for those who fought and died to create what we are blessed today but, also accepting defeat in the furure for all workers.